Patricia Campos Mello is a reporter at large and columnist at Folha de São Paulo newspaper in Brazil. 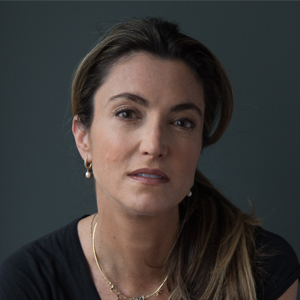 She has been awarded the Red Cross International Committee Prize for humanitarian journalism, the King of Spain Journalism Prize, Petrobras Prize, Folha and Estado Prizes. She was the Washington correspondent for the Estado de S. Paulo newspaper between 2006 and 2010. She covered the economic crisis in the USA, and the 2008, 2012 and 2016 elections; the war in Afghanistan in 2009; and interviewed President George W. Bush in the White House. She covered the 9/11 attacks in New York in 2001. She has a degree in Journalism from the University of São Paulo (USP) and a Master’s in Business and Economic Reporting from New York University, where she received a university scholarship. In the last three years, she has spent time in Syria, Iraq, Libya, Turkey, Lebanon and Kenya reporting on refugees and migration. She was the only Brazilian reporter to cover the Ebola epidemic in Sierra Leone in 2014 and 2015. She speaks fluent English, German and Spanish. She is the mother of six-year-old Manuel. In 2017 she published her book Lua de Mel em Kobane (Honeymoon in Kobane) with Companhia das Letras, in which she tells the story of the war against Islamic State in Syria through the eyes of a refugee couple that she met there.